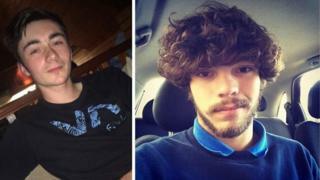 Tributes have been paid to two 19-year-old men who died after apparently taking drugs at a nightclub. The teenagers, who police said thought they were taking ecstasy, died later in hospital. The club was evacuated and an 18-year-old man was arrested by Devon and Cornwall Police. He has been released under investigation, the force said. The family of Mr Reilly, from Newton Abbot, described him as "a much-loved son, brother, grandson and boyfriend" who loved skateboarding and playing computer games. His younger brother Kian said: "My brother was one of the most responsible people I ever knew and everything he achieved I was so proud of, but I was so envious of his talent. "I can't believe he was taken from me and my family from one silly mistake, just trying to have fun on a night out with his best mates." Mr Brock, from Okehampton, was described as "a loving son to Steve and Sandra, an inspirational brother to Liam and Demelza and a loyal mate to all his friends". "Joshua was in his third year studying for a diploma in aircraft engineering at the Flybe Training Academy in Exeter when his life was cut short," the family said in a statement. "He was the kindest, most helpful person you could hope to meet and had a great sense of humour. On Saturday, the nightclub described the deaths as "tragic and very sad", adding that staff were co-operating with the police investigation.